Wearing a VR headset is often seen as a rather individual experience. And indeed, the immersiveness of the experience tends to seclude you from your environment and the people surrounding you. However, there are also different, exciting forms of collaboration in Virtual Reality. Some of these can be very interesting for collaborative learning, or for solving complex problems together. In this article we’ll discuss a few interesting projects, some of which are focused on local collaboration. Almost always when we discuss multiplayer VR experiences, somebody mentions Second Life. And indeed, many of the current multiplayer VR experiences have a similar format. A virtual world which you can join by creating an avatar. You walk around different spaces which you can also create as a user. You can speak to other avatars and attend all sorts of events. There are quite a few of these social network VR applications, some more successful than others. Examples include vTime, VRChat and AltspaceVR, which was shut down in July and now owned by Microsoft. Linden Labs, the creators of Second Life are working on Sansar, a new platform which is currently in beta. There are even a few social networks which are specifically aimed at distance learning, like Edorble and Engage. And of course there is Facebook. As the owner of Oculus, you can expect them to have a solid strategy for social VR experiences. Facebook Spaces didn’t come as a big surprise then, but it still shows a future which creates mixed reactions with our students, especially the VR selfie stick in the end of the video. What makes social VR applications the most interesting to us, is the functionality to design new spaces and experiences, alone or in collaboration. One of the main contributors to Minecraft’s success (also in VR now) has been the blurring of the line between the creator and the player. Players can build entire worlds with the iconic blocks and even code custom mods to alter the physics of the game. All of the applications mentioned above show some degree of freedom to create and manipulate the virtual world. An interesting, yet very nerdy project is JanusVR, an attempt to create a 3D version of the web. Instead of web pages, users create their own 3D spaces. Instead of clicking links you walk through doors. The result is an intriguing new multiplayer interface to the intense obscurity and richness of internet culture. Most of the above projects are above all social network applications. However in the coming years we can expect more and more applications to offer multiplayer functionalities. There are already quite a few multiplayer games out there and we’re starting to see the first 3D creation tools with multiplayer functionality. SculptrVR for example is less well known than Google Tilt Brush and Oculus Medium but offers a multi-player Minecraft-like experience. There are also a few applications that mostly aim on the professional market, offering the ability to collaboratively work on complex 3D projects at a distance, such as TechViz XL. One possible application that we’re really excited about is brainstorming in VR. During a brainstorm session people present ideas, on which other then elaborate and form other associations. In the end, often ideas come up that no-one could have thought of individually. We have a hunch that VR can have a real contribution in this. The right application can offer the participants the ability to present their ideas in different format, by quickly sketching 3D representations. Together you can create a sort of ‘infospace‘ with bits of information you grab from the web: pictures, pieces of text, videos and 3D models. We’re still looking for the right tool for this however, any suggestions are welcome. The examples mentioned above are all aimed at collaborating in a virtual space, with people from around the world. But what if you’re already in the same room together, as is the case in many educational settings? Together with our students we often find simple ways to add social elements to otherwise individual VR experiences. One example is 3D Pictionary. The rules are the same as for regular Pictionary, but now participants have to use Tilt Brush to present their concept. 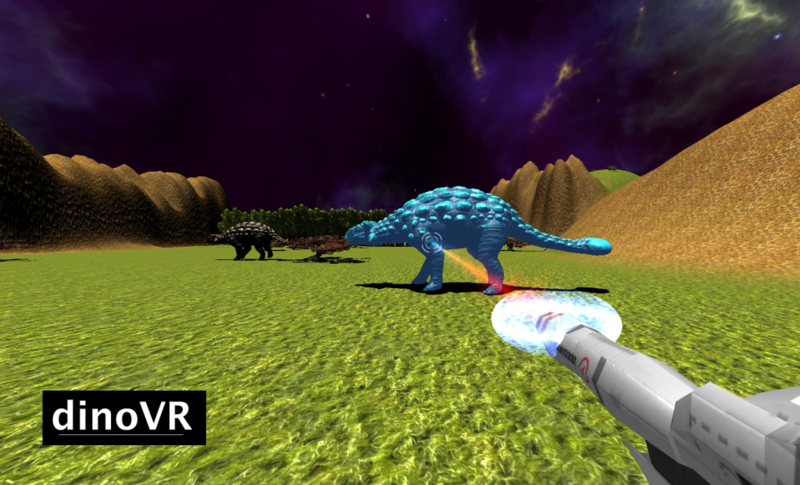 A larger project is DinoVR, created by our former students Gosse Mol, Han Lie and Roos Hoefnagel together with Naturalis. This is a 2-player VR game for 13-year-olds. Only one player wears a VR headset, player 2 has no idea what player 1 is seeing, but has a tablet with an app with detailed information about the different species. Player 1 walks around an alien planet, as time-travelling aliens have kidnapped all our dinosaurs. Together they have to find out what dinosaurs player 1 is seeing. They do this by asking logical questions and communicating very precisely about the different characteristics of the dinosaurs. Only when player 2 enters the right settings for the zapper, player 1 can zap the dinosaur back to the right time period. The idea of the app is to train children in the skills that are required for classifying animal species. Want to read more articles like this? Sign up for our news letter using the form below and we’ll keep you posted!